Location: 150 Causeway St., Boston, Mass. Riots swept the nation the day after Dr. Martin Luther King, Jr. was assassinated, and city officials in Boston were overwhelmed, preparing for a second night of violence. However, on the evening of April 5, 1968, Boston was one of the few major cities in America to remain calm amidst a shocked, angry, and confused country. One man is responsible, and his name is James Brown. Brown had been slated to appear at Boston Garden months before, and Mayor Kevin White nearly cancelled the concert as a safety precaution. Black city councilman Tom Atkins convinced him to proceed with the show and also find a way to organize a live broadcast to keep residents at home. The plan worked, but when it appeared as though things were about to get out of hand, Brown himself stepped in to calm a potential conflict. People began climbing on stage, and white police officers started pushing black concert goers off. When tension threatened to spoil the moment, Brown himself asked police to step back and allow him to handle the situation. Addressing the crowd, Brown explained his actions, saying he figured he'd be able to get respect from his own people. That night, James Brown's televised performance saved the city of Boston. 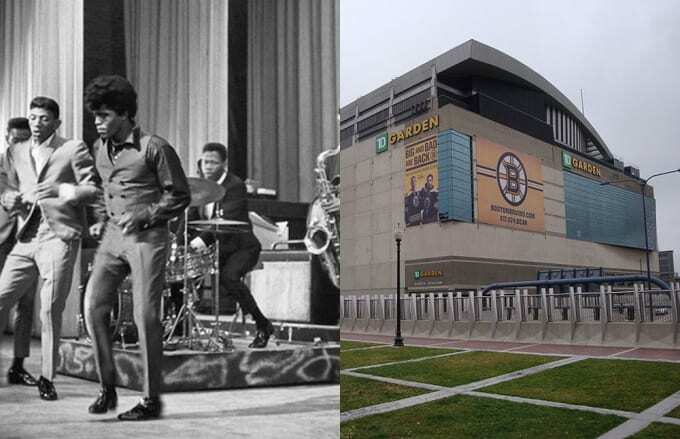 Boston Garden was home to the Boston Bruins, Boston Celtics and various concerts. Because it lacked luxury seating and air conditioning, the building had lost its allure by the early '90s. The final event at Boston Garden was a pre-season game between the Bruins and the Montreal Canadiens in 1995—ironically enough, these two teams were involved in the first NHL game to feature black player Willie O'Ree back in 1958. The parquet and ice of Boston Garden were demolished in 1997, and TD Garden was built just north of the building.